One of the coolest things about our yard is that it's a "hot spot" for blackchin and rubythroat hummingbirds during fall and spring migration. Right after the sun rises, the hummingbirds come to our backyard waterfall for morning baths. Shortly after that, they're looking for breakfast. With 6 feeders, our restaurant seats 24 hummingbirds. But sometimes we're swamped with customers and there's some serious negotiating going on. What I love about these little guys is that even though each one weighs less than a nickel, they're so full of life. They come to the feeders and go for it even if I'm sitting only 6 feet away drinking a cup of coffee. The rubythroats have come a long way to get to our feeders. Many winter in Mexico. Some leave the Yucatan peninsula and fly 500 miles nonstop over the Gulf of Mexico. In our yard, they refuel. When they're ready, they move on to all points north. The blackchins don't migrate as far. Many think our property is a pretty good deal and stay all summer, climate conditions permitting. In other blog posts I've described how birds and animals inspire me. 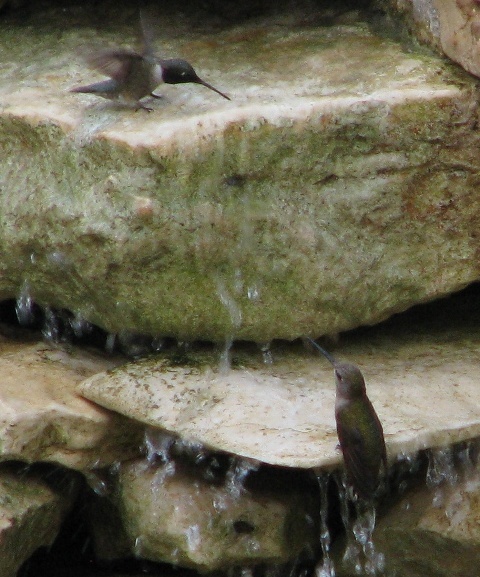 The hummingbirds inspire me to go at high speed and get a lot done. Get up at first light, take a nice shower, have a good breakfast, and then take care of business, with a couple breaks during the day.